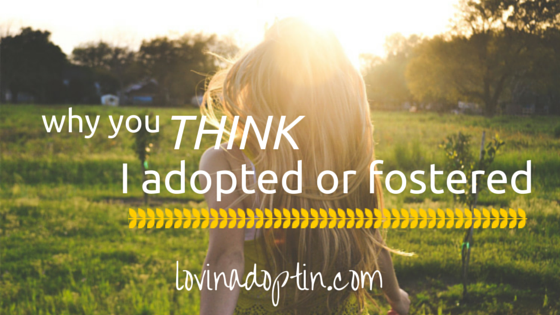 Everyone has their opinions of why people adopt or foster. Some wrong, some right. Family and friends have assumed why we adopted. Why we wanted to adopt from China, why we adopted from foster care, and maybe part of me wants to set the record straight, but a larger part of me knows adoptive parents around the world face these assumptions too. Some reasons (or non-reasons) listed are our own, but many of them are ones I’ve heard from other adoptive or foster parents. 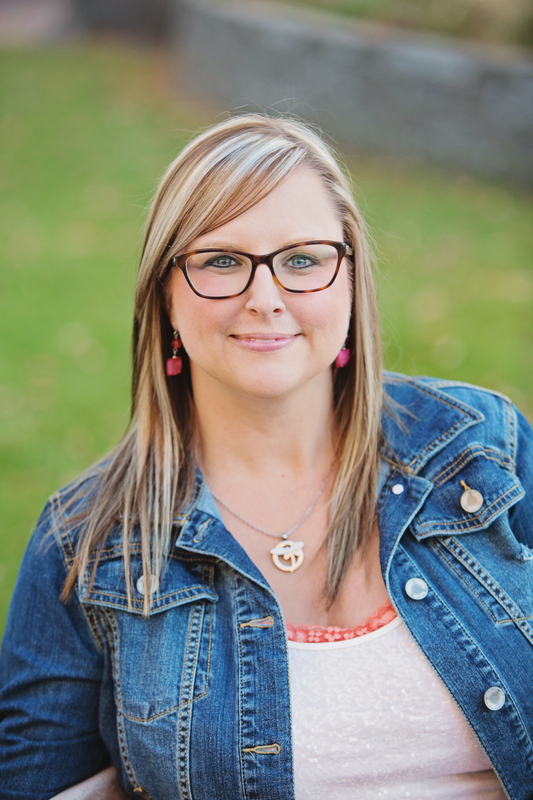 Some of them may be true for you, but untrue for others, it’s simply a general list of what adoptive and foster parents have heard. I didn’t adopt or foster because I can’t have biological children. I can have other reasons for wanting to bring a child into my home through adoption or foster care. Maybe I know about the millions of children in the world who need loving families, so why do I need to give birth to one? Maybe we have dreamed of bringing a child into our home who needs love, and don’t feel bound by society’s standards of conceiving a child. I didn’t adopt internationally because I don’t care about kids in the US. When we were on the path of adopting from China, we were asked why China and not the US. I like to say, “God created the world, He didn’t specify who we need to take care of, there are millions of children around the world who need loving homes.” And honestly, if Americans didn’t adopt internationally, there would be a much larger orphan problem in the world. One family may be called to Istanbul (or name a country), but you may be called to adopt locally. Each of our hearts are pulled in a direction, a country, foster care, domestic adoption, whatever it may be, it’s where we’re supposed to adopt from. I don’t do foster care because I want to be the pillar of my community. I do this because there are children who need good homes, families who care about the kids as their own. I didn’t adopt from foster care because I don’t care about children in other countries. It’s what was right for us. I feel it’s important to take care of the children in our country, in our city. I heard the statistics, I heard about the need for foster care and wanted to do something. I found out that children are available for adoption in my country and I decided this is how I wanted to go about adopting. I didn’t adopt because it’s the popular thing to do, because the celebrities are doing it. I did it because I wanted to. I didn’t adopt to get another badge on my Brownie sash. Been there, done that. Adopting takes dedication, it lasts a lifetime, and sometimes it’s not easy. So no, I didn’t do it to receive approval from everyone else. 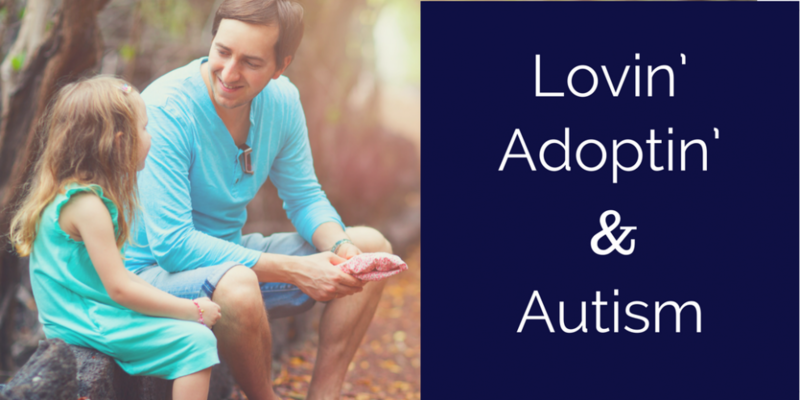 I talk about adoption because I’m passionate about it, it’s how I became a mom to my kids. I wear shirts that say “adoption” because I want others to realize there are children waiting for families to hold them, care about them, and send them off to school with a hug, not because I want to be recognized for what I did. I didn’t adopt because some kids on a website were cute, I didn’t do it because I “couldn’t resist.” Adopting takes work and dedication. It goes far beyond a photos and adorable smiles. I didn’t adopt a child from Russia so he would look like me. I didn’t adopt a girl from China because she’s beautiful, I didn’t adopt from Ethiopia because African children are all the rage. I adopted from the country I chose because that’s where I was led, whether I believe fate, destiny, or God led me there. That’s where my child was and I brought him home. Adoptive and foster parents were led to their choices for many reasons, many of them I haven’t listed, for many their answers are different than the ones I give. 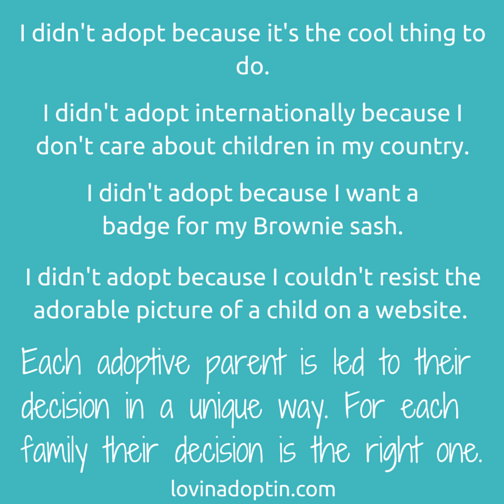 If you have other reasons for adopting or fostering, or you want to share assumptions that have been made of you, please share in the comments. You can receive each post made to Lovin’ Adoptin’ by subscribing in the upper right corner. If you’re on a mobile device, you may need to do this on the web version. You can also “like” my Facebook page and follow me on Twitter and Pinterest for more helpful information and links.